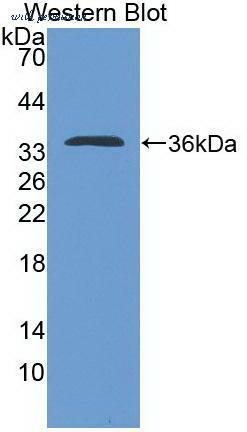 The IL-4 antibody from Proteintech is a mouse monoclonal antibody to a fusion protein of human IL-4. 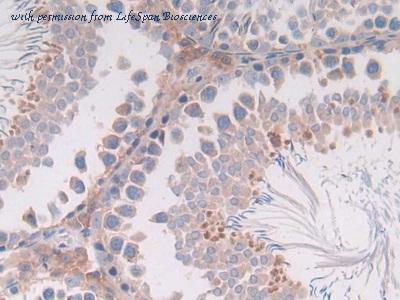 This antibody recognizes human antigen. 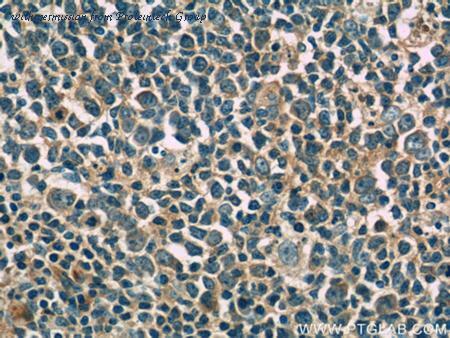 The IL-4 antibody has been validated for the following applications: ELISA, WB, IHC analysis. 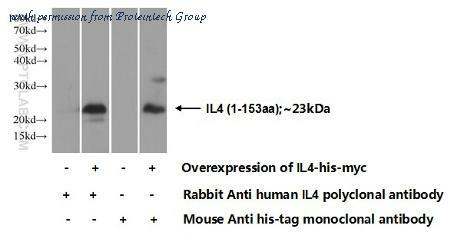 The IL-4 antibody from Proteintech is a rabbit polyclonal antibody to a recombinant protein of human IL-4. This antibody recognizes human antigen. 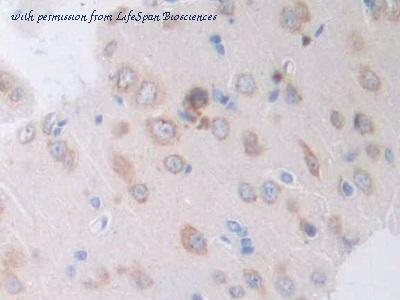 The IL-4 antibody has been validated for the following applications: ELISA, WB analysis. Cell Proliferation Induced by IL-4 and Neutralization by Rat IL-4 Antibody. Recombinant Rat IL-4 (Catalog # 504-RL ) stimulates proliferation in the rat splenocytes in a dose-dependent manner (orange line). 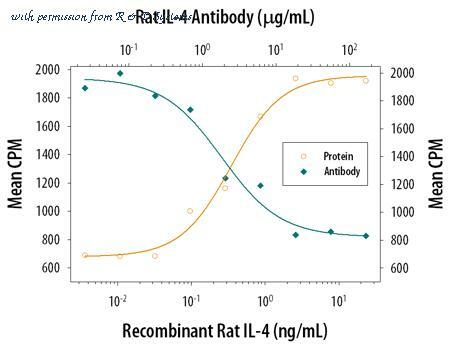 Proliferation elicited by Recombinant Rat IL-4 (4 ng/mL) is neutralized (green line) by increasing concentrations of Goat Anti-Rat IL-4 Antigen Affinity-purified Polyclonal Antibody (Catalog # AF-504-NA). The ND50 is typically 0.05-015 ╡g/mL in the presence of PHA (10 ╡g/mL). Cell Proliferation Induced by IL-4 and Neutralization by Rat IL-4 Antibody. Recombinant Rat IL-4 (Catalog # 504-RL ) stimulates proliferation in the rat splenocytes in a dose-dependent manner (orange line). 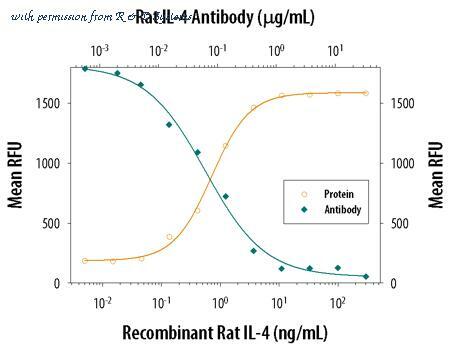 Proliferation elicited by Recom-binant Rat IL-4 (4 ng/mL) is neutral-ized (green line) by increasing concentrations of Mouse Anti-Rat IL-4 Monoclonal Antibody (Catalog # MAB5041). The ND50 is typically 0.8-4.0 ╡g/mL in the presence of PHA (10 ╡g/mL). 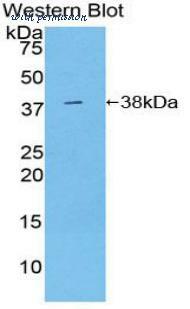 Western blot of recombinant IL4. This image was taken for the unconjugated form of this product. Other forms have not been tested.